Wire is such a fun art medium and is safe for kids of all ages – just offer some adult supervision with the young ones. Wire is also forgiving, so if things get a bit frustrating, everything can get smoothed out and the project can be started all over. There’s nothing like taking something malleable and bending it into a three-dimensional creation – and wire is just the thing to use for this project. Think crazy, tall sculptures depicting people and animals with elongated limbs. That sums up the famous sculptures of Alberto Giacometti, who was a Swiss born sculpture and artist who left home as a young man to study in Paris. After only a few short years, Giacometti was showing with other artists and getting lots of attention. His somewhat Surrealistic and Modern style of creating the human form evolved over the years. But those amazingly tall and elongated forms are what created such an impression on the world. Along with seeing a human form taken to its bare essentials, the viewer recognizes the empty space around his sculptures creating a tension between the artwork and its surroundings. Although many of Giacometti’s sculptures evoke a sense of loneliness or sadness, they also have a feeling of movement and progression. After taking a closer look at Giacometti’s sculptures, invite your child to create a couple of quick sketches for his elongated form sculpture. He can focus on a pose or part of the body to create a feeling for his creation. Now he can get out some wire to use for bending and shaping his sculpture. Along with different gauges of wire (which can be picked up at any craft store) a nice, sharp pair of scissors and needle-nose pliers comes in handy. If you don’t have a needle-nose hanging around, a regular pliers works great, too. Invite your child to cut a few length of wire, about 3 to 4 feet in length, and get started bending and twisting to create the base for his sculpture. Once he’s feeling good with how things are going, he can cut and bend more wires to fill in his Giacometti inspired form. Encourage your child to also think about balance and how to create a sturdy sculpture that will stand on its own (with a little help). To finish things off, offer your child some plain old masking tape and start wrapping his finished wire creation in tape. If some of the wire pops through, no big deal. 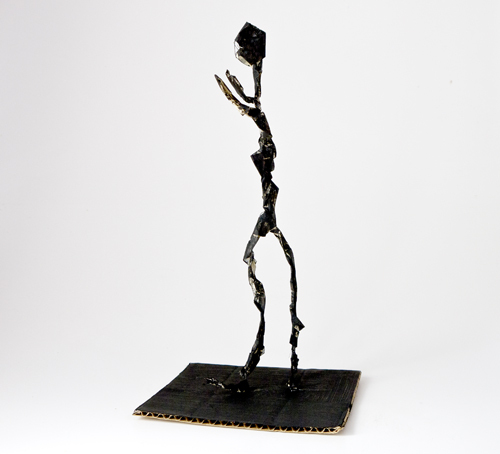 Most of Giacometti’s sculptures were created from cast metals with a black finish. Your child can accomplish the same result by coating his tape wrapped wire creation with some black tempera paint. Now he can stand up his sculpture (with the help of some clear plastic tape) on a piece of painted black cardboard for a completely finished effect. Your child can keep bending and forming Giacometti inspired sculptures and create a collection perfect for displaying in a special spot in your home!